$69.95 & FREE SHIPPING!This item only, USA and military address only. We will ship our choice of either Fed Ex Ground/Home, USPS Priority Mail or 1st class package. If additional items are ordered without free shipping the weight of this item will not be added to the package, saving $$ on multiple items ordered. For International orders, contact us for discounted shipping prices and options. The Wiley-X Spear Tactical Goggle is a low profile multi-functional goggle that meets the MIL-V-43511C Ballistic Requirement. 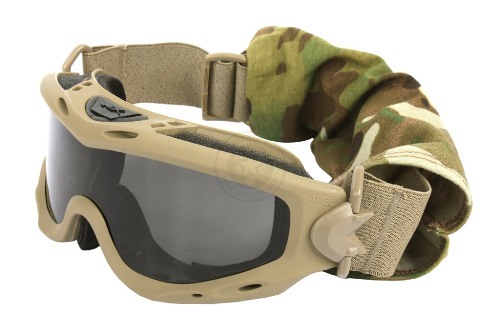 It is NVG compatible and features top down ventilation to ensure a fog free lens. The Wrap Back design helps to eliminate tunnel vision and provides an unmatched field of vision. The swivel hinges allow for wear with or without a helmet and the heat resistant frame and strap material helps improve comfort.